Mars Meteorological Data and Graphs: Latest Pathfinder and Viking. Meteorology Experiment: Details of the Pathfinder meteorology experiment, including the cruise configuration, science goals to help understand the science observations. Cruising to Mars Meteorology mast temperatures during the cruise health checks showing the effects of spacecraft orientation and distance from the sun. This Mission Summary includes an overview of the Mission an its landed Flight System components, the Lander and Rover. Science goals and investigations are described under the instrument headings; Imager for Mars Pathfinder , Alpha-Proton-X-Ray Spectrometer and Atmospheric Structures/Meteorology. Other additions describe Rotational and Orbital Dynamics and Dust, Electrostatic and Materials experiments. Mars Pathfinder, NASA's latest mission to Mars, was launched December 4, 1996 and arrived on July 4, 1997! Here you will find the latest Pathfinder Mission Status or a list of all the mission status announcements. Download and Build Your Own Model of the Mars Pathfinder Spacecraft! Learn more about Sojourner, the Mars Pathfinder rover. 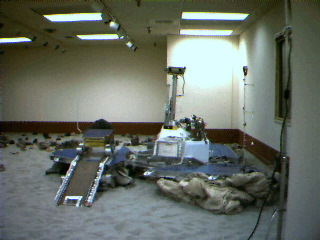 * Operational Readiness Tests, ORT, simulate Entry, Descent, Landing and several sols ( a sol is a Mars day of 24.66 hours) of operations on Mars in the Pathfinder "Mars Room" at JPL, as it will take place beginning on 4 July, 1997. These graphs and data only illustrate the sampling strategies since the Mars Room temperature is warm and constant, unlike the cold, widely varying temperatures on Mars.